Adiaphora in Christianity refer to matters not regarded as essential to faith, but nevertheless as permissible for Christians or allowed in church. What is specifically considered adiaphora depends on the specific theology in view. I love this concept. One of the best ideas I got from seminary. It's "the stuff we agree not to argue about." It doesn't mean we agree on how we do it - only that this thing (whatever it is) will not separate us, in faith, friendship or fellowship. The opposite, I guess, of "adiaphora" is "anathema" - the stuff that is utterly rejected or "beyond the pale," as they used to say. It put names to things that I'd felt all my life. I knew, from the way I heard God's supposed words preached, that God liked "us" and didn't like "them," and while I knew that I loved God and I wanted to be like "us," I also knew that at rock-bottom, I was "them." (Trust me, I have since learned much differently, and found great acceptance for the "thems" among us). First, I was a former Catholic in a Lutheran church. This was definitely an us-vs-them thing! However, I received a pure inspiration one day, when someone said, "But you weren't BORN Lutheran! How can you preach effectively to life-long Lutherans?!?" The gift I believe God gave me was simply this: "Correct me if I'm wrong - but I thought Martin Luther was a former Catholic - and somehow he turned out OK..."
I was also a childless, profane and divorced man and a recovering alcoholic in a church full of happy and polite families (or so they would have had us believe). But as I threw myself into service, they came to love me despite my "rough edges" and "unfortunate earlier life." The gay thing, though, was one from which I could never get free. Looking back over the wreckage, I'm not entirely sure that the only reasons for me to go to seminary was so (a) I could find a group of accepting and loving people in some of my professors and theologians, and (b) that the God of my misunderstanding could drop me 750 miles away from my guilt community, into a world in Hyde Park that was richly populated with faithful, celibate, deeply devout and thoroughly-gay priests, as well as faithful gay ministers and lay people. They taught me the difference between "who I am" and "who or what I sleep with." 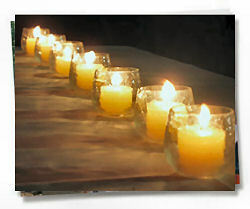 They taught me alternate ways of understanding the holy words that I felt condemned me for years. And they showed me a way of being a faith-community in which homosexuality itself was adiaphora. "You love God? You enjoy the community and the ceremonies? Then come along - our God is big enough to sort all the rest of it out in the end." We are ALL different. Some of you might well think I'm an idiot, madman, fool and free-thinker because I choose not to spend a lot of time around children! (My favorite prayer for children comes from the late storyteller Gamble Rogers: "Let them that want none have memories of not gettin' any.") That may be a difference between you and I - but it does not separate us. I value motherhood and fatherhood, even though I would not choose to participate in it. The very fact that my friend Ravenmoon even deals with diapers - regardless if they are cloth, paper, or some future atomic-force-field variety - makes her a MUCH better person than me. (Please note: gay men have nothing on new-parents when it comes to the "ick factor"!) She also mentions a not-often-mentioned taboo - women who do not shave. For me, I could give a rat's patootie about what parts of her that do or do not get shaved - because all of these things are adiaphora to me - they do not show me her soul, and they certainly do not separate us in our beliefs. Even the Buddhist thing just doesn't faze me. When it comes to being excluded from "the body," I have never felt from any other faith group the kind of apart-from-ness that I have felt from wide swaths of Christianity - so their moral mandates about being "THE way and THE truth" ring more than a little hollow. Buddhist practices and beliefs may not jive with all of mine - but I find much of the Buddhist tradition that shares ground with what I have come to know, as well. A Catholic, Father Roy D. of New York, talks about how much of the experiences he had sitting-lotus in ashrams and temples in Southeast Asia reminded him of the spiritual exercises of St. Ignatius (founder of the Jesuit tradition in Catholicism). Even if nobody else sings along! My experience is that the rare people-of-faith who are honest about their faith find it just as cracked and flawed as my faith seems to me. I "identify" with them, because they are broken toys too - yet they consider themselves "believers," too. So I guess that if they qualify, so can I....and that's good enough for me. None of us are the same...in appearance or beliefs. All of us have hangups and "baggage," to be sure (I sure do, anyway). But, as the song from "Rent" says, "I'm lookin' for baggage that goes with mine." To be real, to be honest about who and what I am, always runs the risk of rejection. It also runs the risk of finding community and building relationships - which is almost always worth the risk. In your job search, you will encounter two groups of people: those who will not be bothered by [insert your issue here] and those who will be bothered by it. Your job is to say "Thank you very much, have a nice day" to the second group of people - and then go on and find the people in the first group. That has become my mantra, in these later years. 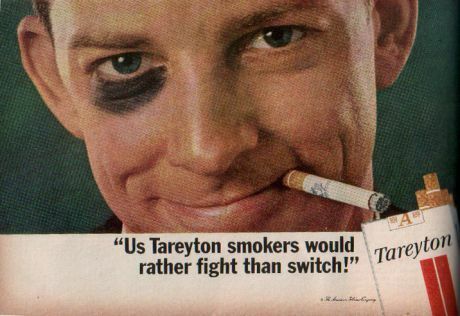 Back in the 60's, they actually allowed advertising for cigarettes, and one memorable campaign was for Tareyton cigarettes. It featured people with artificially-blackened eyes and the slogan "I'd rather fight than switch." I am finding that I have become somewhat of an Anti-Tareyton-Man - I would much rather switch than fight. If you can find common ground with me, let's walk the road together. If not, then be on your way without me - don't let me hold you back from your appointed rounds; you surely shall not hold me back, either. You also need to know that there have been remarkable instances of grace in this journey, as well. There is a man named John who I know from the recovery community here. He's a family man, a man of faith, a hail-and-well-met fellow, and a pleasure to be around. He tends to be more politically-conservative than I, and I suspect (but never have confirmed) that his church might be more than a little uncomfortable (both theologically and socially) if I showed up arm-in-arm with Chris to services on a Sunday morning. But here's the deal: John has come to know me. And my partner Chris. And John has come to see us as people, and I have come to see him as a friend. No, we will probably not be in the same line at the voting booth; I probably wouldn't join his church (though I'd be happy to visit, and I'd sing right along with him in the hymns of faith). But we can share large parts of our life and our recovery - because we find, and focus on, the parts of our lives that are common. And that, as they say, is close enough. I haven't been reading your blog for very long (I think this may be my second post), but I just wanted to see that I really enjoyed reading your thoughts here. I think about the ways in which I fail everyday- whether that's in my faith or just life in general...But we keep on trucking, us broken toys, and that is what counts (I hope). Gosh, welcome home, Steve man! It's been too long! Good luck on the move, and when possible, see it for the opportunity for you that it may well be. Grace.